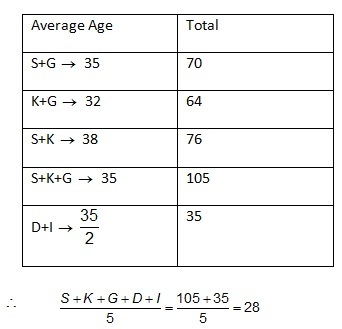 The concept of ‘Averages’ generally comes in all the MBA entrance exams. Therefore, it is important for the candidates to prepare for this topic to crack the questions based on averages. 'Average' can be defined as a measure of average is a number that is typical for a set of figures. This concept comprises of questions of three types i.e. mean, median and mode. 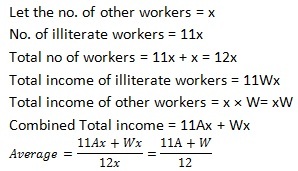 The aspirants get these questions in MCQ format and 2-3 questions from this topic are expected in the exam. Practise the questions on ‘Averages’ and prepare for the MBA quantitative aptitude section of MBA entrance exams. 1. In Resort Oasis, there is a three storey building, and rooms are numbered from 151 to 180 on the first floor, 231 to 270 on the second floor and 316 to 355 on the third floor. In the month of October 2014, 50% rooms are occupied on first floor, 40% on second floor and 70% on the third floor. If it is also known that the room charges are Rs. 300, Rs 100, and Rs. 200 on each of the floors, then find the average income per room for the month of October 2014? 2. A train normally covers a certain distance at a speed of 120 km/hr. However, if it were to halt for a fixed time interval in each hour its average speed reduced to 100 km/hr. 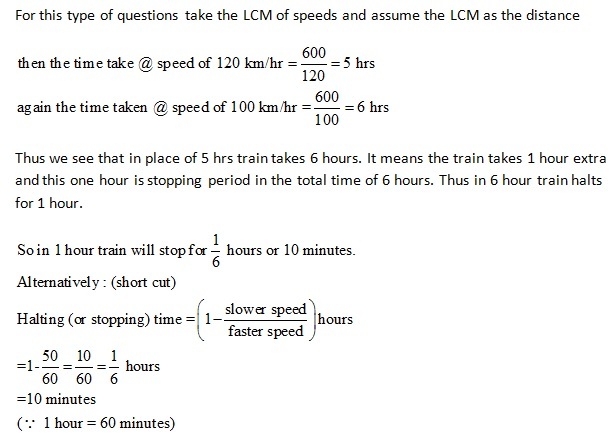 What is the time interval for which the train halts in each hour? 3. There are 84 students in block A of a residential school. Due to the admission of 26 new students, the expenses of the mess increase by Rs. 62 per day while the average expenditure per head diminished by Rs. 3. What was the original expenditure of the mess? 4. A family consists of grandparents, parents and three grandchildren. The average age of the grandparents is 65 years, that of the parents is 40 years and that of the grandchildren is 12 years. 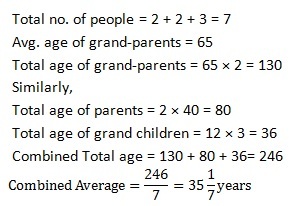 What is the average age of the family? 5. In a Mock CMAT, 103 students appeared and the average score obtained was 120. If the score of the toppers is eliminated from the average, the average score decreases by 1.5. Further, it is observed that the score of the top three candidates is in integers. If the student standing second has scored more than 175 marks, then find the highest possible score of the student standing third. 7. Of the four numbers, whose average is 60, the first is one-fourth of the sum of the last three. The second number is one-third of the sum of other three, and the third is half of the other three. Find the fourth number. 10. Number of members in the upper house and the lower house of parliament is 200 and 300 respectively. The average age of the members of Lower house and Upper house is 40 years and 50 years respectively. A member of the Upper house leaves and becomes the member of the Lower house. Thus, the average age of both the houses increases. a) The age of this member is greater than 50 years. In this section we will explain the rationale for choosing the answer pertaining to every question. 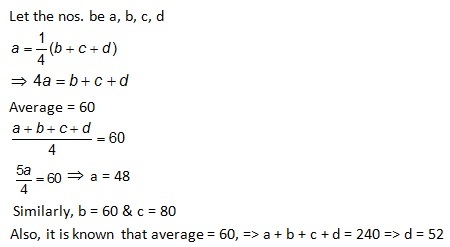 After practicing these MCQ(s), you would be able to understand the concepts of Averages. For more exercises on MBA Quantitative Aptitude Section, subscribe with us and receive the laest practise test to prepare for MBA entrance exams.